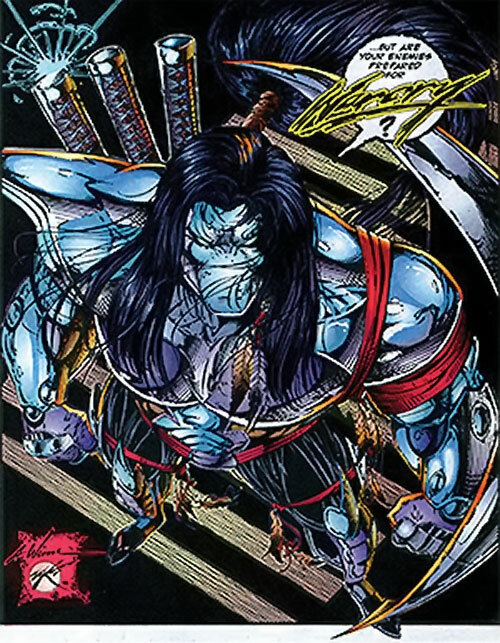 This very, very 1993 Image Comics character indeed first appeared in a 1993 Image comic book. So yes, your guess was impeccable, though it wasn’t hard. Brigade Sourcebook later made stuff up that doesn’t match with his earliest appearance. We’ve thus chosen to favour the secondary source (much of the material here quotes or paraphrases from the Sourcebook), since there was too little material in the primary. Height: 6’1” Weight: Varies with organic steel armour. 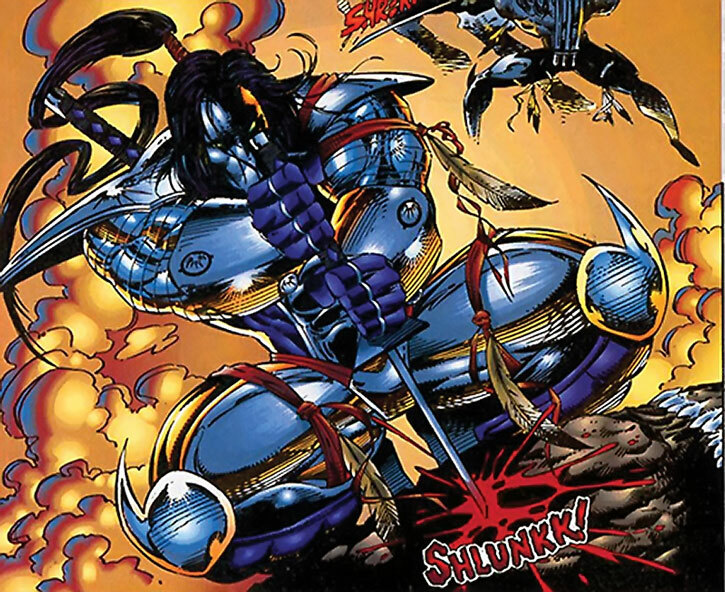 Warcry is a big guy and a master martial artist drawing from at least two warrior cultures. He can engage multiple highly skilled opponents, even the likes of Boone and Kayo. Part of this ability stems from his “mysterious ancient American Indian arrowhead” pendant. 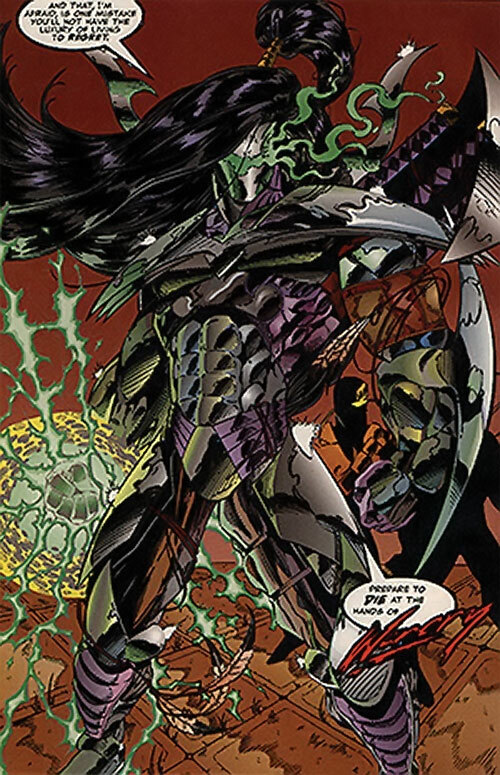 It allows him to generate and manipulate his organic steel armour for maximum protection, and grow pointy and slashy bits from it for use as close combat implements. He also once grew climbing spikes from his palms. The arrowhead also imbues him with superhuman strength, and renders his swords and other weapons nigh-invulnerable. Warcry was seen shooting energy blasts from his hands. Based on his tactical choices, the game stats assume that he had but a few such shots to use on a given sortie. Warcry is descended from an ancient clan of Japanese warlords, operating from a hiden forest sanctuary. This clan had strange traditions. For instance, its numbers could only be expanded every three decades. Children born between such periods were sent away. In the case of the infant who would become Warcry he was cast at sea. This presumably happened during the XVth century at the latest. The baby crossed the Pacific. He ended up on what would become the West Coast of the US. How that happened is unrevealed, but it must be quite a story. Once on dry land, the baby was adopted by a since-extinct tribe of Native Americans. He happened to fulfil a prophecy about the coming of a fierce and brave warrior from the sea. The tribesmen had been keeping a magical arrowhead intended for this hero. This magic is presumably what allows Warcry to remain young and vigorous even to this day. His exploits among the folks who adopted him remain unchronicled. Warcry eventually went on a quest for his roots. He travelled back across the ocean to find people looking like him. He did reach Japan, where he received further warrior training from a descendant of his clan. But the clan itself had mysteriously gone missing. 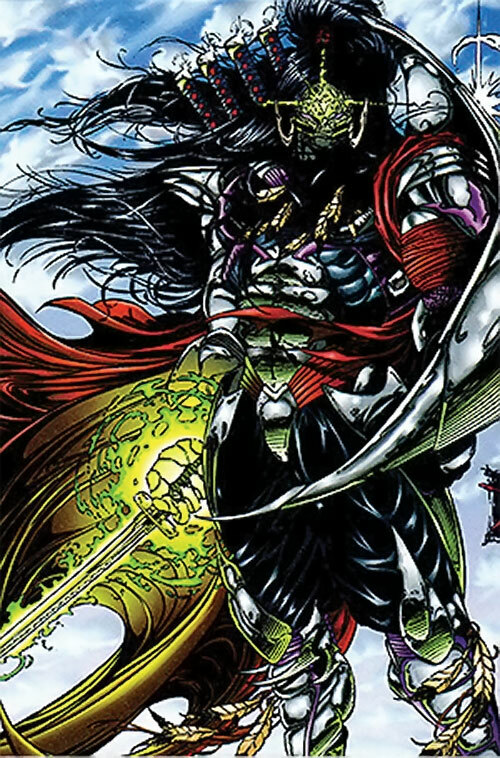 Warcry reportedly became a “peacemaker” in Japan. What that means is unclear. When he was actually seen, he was protecting the Yakuza crime lord Tatsu Soroyama. 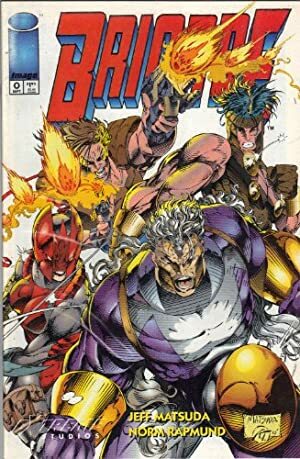 However, he was defeated by Battlestone’s team (Battlestone, Boone, Kayo and Lethal) who had been hired to kill the oyabun. This death plunged the Japanese underworld into bloody gangland killings and endless vendettas. It is thus likely that Warcry was the good guy in the story, and was working on promoting a stable order in the Japanese underworld before the oyabun would pass on. Thus, his general role might be that of a regulator, accepting the existence of crime and the yakuza but working to ensure that the underworld is run responsibly and harmoniously. By 1993, the “peacemaker” was working security for the younger Soroyama. Kayo had returned to kill the new oyabun, as he felt responsible for the terror and abuse in the Japanese underworld since the previous assassination. Kayo murdered several of the younger Soroyama’s lieutenants but was then stopped – presumably by Warcry. Lethal came to bail Kayo out, as did a Brigade team led by Battlestone. At the same time, the WildCATs came to investigate rumours of the new oyabun owning an alien orb. 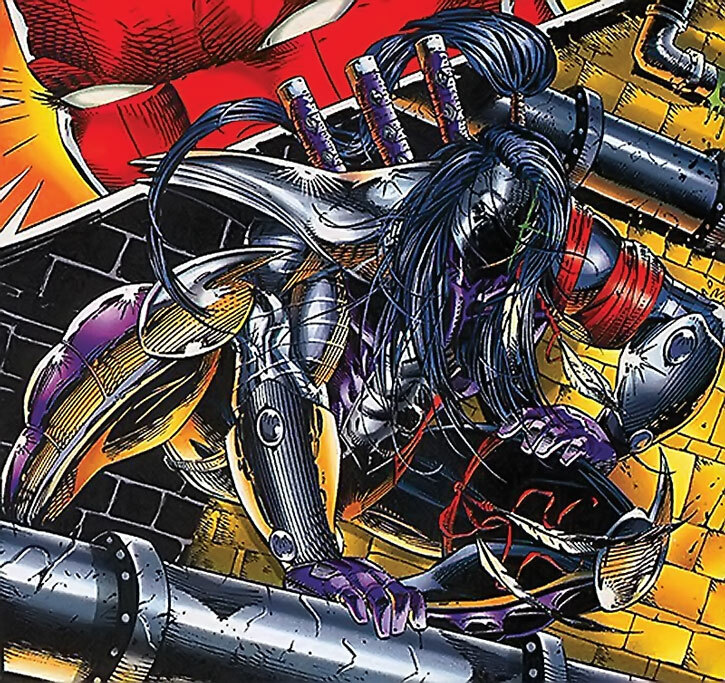 Even Warcry was overwhelmed by the number of super-powered operatives gallivanting about on the Soroyama estate. However, he seized the occasion to kill a murderous sewer monster as it attacked Brigade members. Warcry eventually admitted that he disapproved of the psychotic new oyabun’s ways. The warrior only served the younger Soroyama out of loyalty toward his departed father. Since he saw no honour in fighting to the death for the sake of a reprehensible psychopath, Warcry just walked away. To my knowledge hasn’t been seen since. 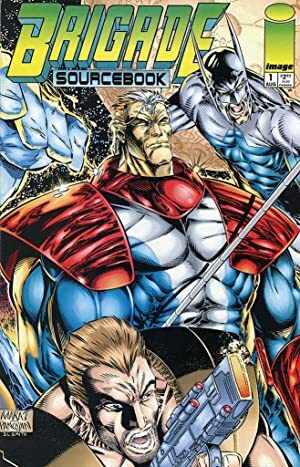 This is a Liefeld character, so he can make his left eye glow for no reason. Big tough overbearing noble ancient exotic warrior. You know the type. 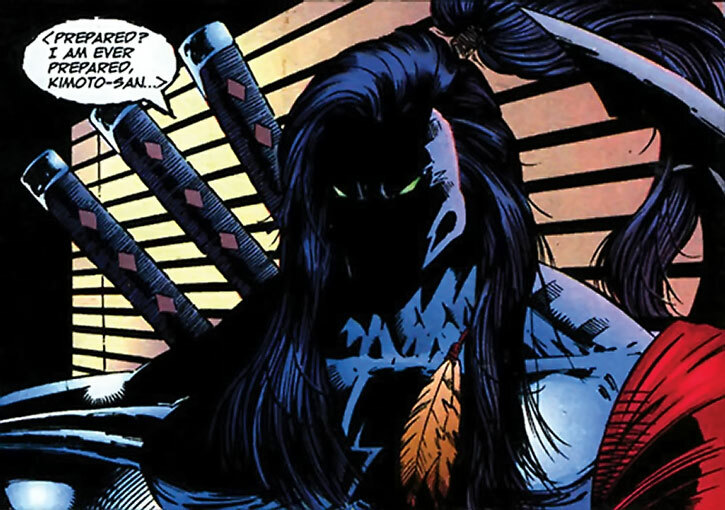 The tribe he was associated with may have been the same as Arak, Son of Thunder’s – the Quontauka. These folks lived during prior to the IXth century on the East Coast, but we’re well past the point of quibbling about that. Area Knowledge (Japan), Expertise (Japanese underworld cultures and dynamics), Familiarity (ancient Japanese and unspecified ancient Native American warrior philosophies), Language (Japanese, unspecified Native American languages), Lightning Reflexes, Iron Nerves. Mystical Arrowhead [BODY 10 /STR/ 07 /BODY/ 07, Enchantment: 06, Energy blast: 09, Omni-Arm: 08, Skin armour: 02, Advantage: Near-Immortal, Bonus: Skin armour also works against Energy Attacks (+2), Limitation: All but one AP Enchantment can only be used to increase the BODY of the weapons he wields or carry, though these have a sort of Area of Effect (enhancing all the weapons he carries). Japanese swords (x5) [BODY 09, EV 05 (08 w/enhanced STR, 10 w/Martial Artist), Sharpness (EV): 01]. Smoke cartridges (x6) [BODY 01, Fog: 05, Grenade Drawback]. Usually used to even the odds when facing multiple opponents. Source of Character: Image / Awesome Universe, created by Jeff Matsuda.